I couldn't resist reviewing this humorous, lively picture book that doesn't want me to put it down. I haven't been so much into comedy per se in my life, but this book is making me change my mind. I am into dragons of course as my MA thesis was based on an unpublished picture book about the courage of dragons. Now, I also love the humor of dragons who are both endearing and enduring in children's lit. I'm discovering that there is a wonder in humor as it somehow slips deeply into our beings and finds funny bones that may have been buried for awhile, which is true in my case. 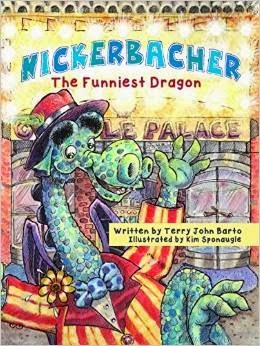 I hope you let Nickerbacher stir your sense of humor and that of all the young readers in your life. Who doesn’t love dragons; but, a dragon with a cracking sense of humor, why that may just be the best kind of dragon! Nickerbacher is just such a young dragon. He loves to tell jokes and wants so badly to be a stand-up comedian, but his papa would rather he obey the long-standing dragon tradition of protecting princesses, breathing fire, and fighting knights. Princess Gwendolyn and Prince Happenstance, who Nickerbacher jokingly calls Prince Fancypants, also have their own dreams. The three of them encourage one another to follow their visions. They are the best kind of friends. This book by Terry John Barto has a lively pace and funny jokes that mesmerize the young reader, the younger ones being read to and the older ones who can now read to themselves and to one another. The illustrations are carefully rendered in a lively, page-turning style that keeps up with the text pacing. The art depicts a pleasing and droll young dragon with Groucho Marx eyebrows and a prince who carries modern-day mints to toss to dragons. The book is a must in the classroom as it encourages young readers from 7 to 10 or so to keep picking up books. Teachers will no doubt hear a lot of jokes after introducing this book and can use it to set up a little writing unit about humor, maybe even have children make their own illustrated comedic books. Oh, it's too bad I didn't have this book in my classroom library when I was teaching. You are so right. Kids love jokes, and I'm sure they would have enjoyed this book. We love elders!! We love pumpkins! !